As athletes know, joint pain is common when you repeat a particular motion. Whether the motion is swinging a baseball bat, keeping up with your doubles partner in tennis or performing heavy lifting at work, elbow pain may result if the muscles, tendons and joints are overused or strained. 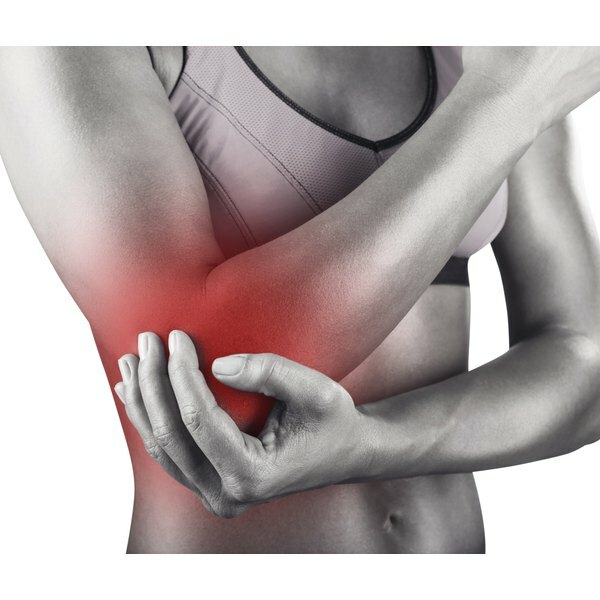 Elbow pain can be a symptom of tendinitis, bursitis, tennis elbow or simply a muscle strain. Initial treatment to relieve elbow joint pain is similar, no matter what the specific ailment is. Rest your arm when you experience elbow pain. This may mean taking a few days off from sports or limiting other everyday activities that may aggravate your joint pain. Apply an ice pack to your elbow to reduce inflammation and relieve some of the pain. Ice in 15-minute sessions, up to three times daily. A bag of frozen vegetables can conform to the shape of your arm and may work better than ice cubes. Immobilize your elbow for several days to allow the ligaments, tendons or bursae to heal. These are the areas near the joint that can become inflamed when you have tendinitis, tennis elbow or bursitis. Use an Ace bandage or a sling to keep your arm still. Take pain medication, such as ibuprofen or acetaminophen, to relieve your elbow pain. Follow the directions on the packaging or seek specific dosage instructions from your doctor. Schedule an appointment with your physician if your elbow still hurts after several days of self-treatment. You may need X-rays or other diagnostic tests to determine the source of your joint pain. Some types of elbow pain, such as from bursitis, may require physical therapy and gentle stretching to help you heal. Seek immediate medical attention if you develop a fever or notice that the skin around your elbow is red and warm to the touch. These are signs of possible infection and must be treated as soon as possible.